This entry was posted in General and tagged CP, Excel, Spreadsheet by Allen. Bookmark the permalink. Hi can you tell me the amount of infantry an APC can carry? Gibby, that number is different for every APC, you can find that info on many sites like WikiPedia, just search to for the particular vehicle you are interested in. For the purposes of TAC II, each APC carries one squad or fire team. The exact number of troops is not relevant because an infantry counter is a “team” or “squad” and operates as such. As the rules were originally designed for 1/285th scale gaming, using individual figures is not practical. Most of my infantry stands have 4-5 guys on them … but again it does not really matter as they are all treated as a Fire Team. Hi sorry to bother again but what kind of infantry platforms do you recommend? 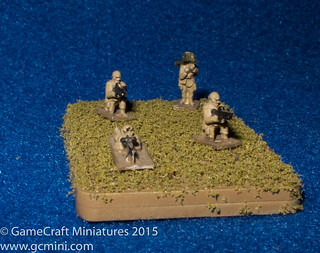 You can find it here http://gcmini.mybigcommerce.com/6mm-infantry-bases/ … I make 7 different configurations of it.